Beer industry veteran Chris McJunkin, who most recently served as the chief revenue officer for BrewDog USA, will take an equity position in Atlanta’s Scofflaw Brewing when he officially joins the company at the end of the first quarter. McJunkin — whose resume includes a 2.5-year stint as the vice president of sales for Founders Brewing Company, a five-year run as the western sales director for Vermont Hard Cider and nearly seven years with Craft Brew Alliance – joined the fast-growing craft brewery as a paid consultant at the beginning of 2018, co-founder Matt Shirah told Brewbound. In his new role, McJunkin will oversee sales and distribution and help Scofflaw grow its off-premise retail presence as it continues to expand the availability of canned products. Last month, Scofflaw inked a one-year contract brewing arrangement with BrewDog USA that enables the company to continue growing as it expands its own brewery capacity to 30,000 barrels. 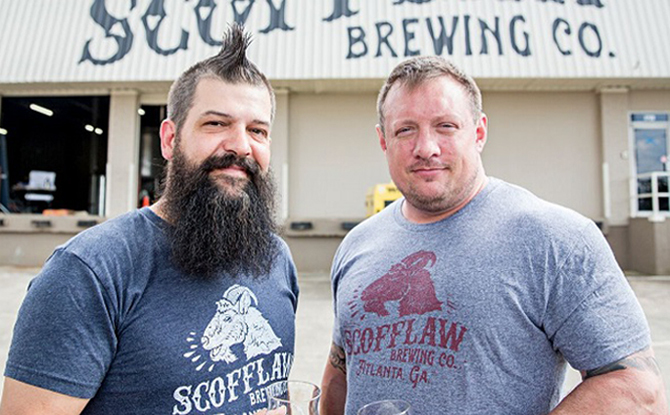 In March, Scofflaw will install a 50-barrel brewhouse at its current facility, located in the Bolton neighborhood of Atlanta. Shirah, who admitted that rapid growth has forced the brewery to “add structure” and “fill some holes,” said he plans to announce the hiring of a chief financial officer in the second quarter. The company is also in the process of identifying a chief operating officer. Shirah, who co-founded the brewery with Travis Herman, will remain as CEO. Herman will continue to serve as brewmaster. ATLANTA (Jan. 9, 2018) – Scofflaw Brewing Company founders Matt Shirah and Travis Herman are planning for the future of the Georgia brewery that has experienced phenomenal growth in its first 18 months of operation. With eyes on continuing growth, the co-founders have announced veteran beer industry executive Chris McJunkin will join Scofflaw as a partner. McJunkin helped BrewDog’s transition into the U.S. market while working with CEO James Watt and helped establish the Ohio brewery’s partnership with Scofflaw.